Denmark’s selection of beans is paltry at best. A few weeks ago, wanted to serve my veggie enchiladas at an impromptu dinner party, but I couldn’t because I hadn’t soaked any dried black beans and none of the four grocery stores I shopped had them in cans. Dried beans are definitely the most economical choice, but they’re not the most convenient choice, and in Denmark, they’re pretty much my only choice. In the absence of oh so convenient canned beans, I’ve had to learn how to freeze cooked dried beans. 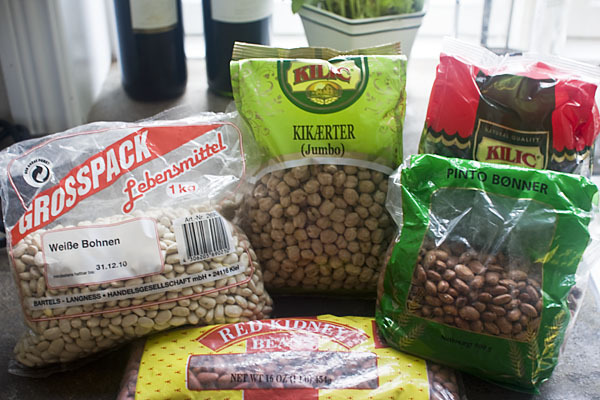 Danish grocery stores also don’t carry much in the way of dried beans. I can sometimes find lentils, but mostly I buy my beans in 900g bags at a middle eastern market for around 20 DKK (about $3.75 US). When I lived in the US, I always kept a few recipes worth of canned beans on hand for convenience. Now, I always have to plan ahead, or pressure cook my dried beans in bulk and freeze them, which ends up being cheaper and just as convenient (in the long run, anyway) as the canned beans I used to buy stateside. In figuring out how to freeze cooked dried beans, I’ve that the best way is to pressure cook the beans for a minute or two less than I would if I were planning to use them fresh out of the cooker; they don’t freeze and reheat well if they’re too soft. After they’ve cooled, I spread them into a single layer on a cookie sheet and freeze them, then depending on my level of ambition, I vacuum seal them into 1.5 cup portions, which is the equivalent of a 15.5 oz can, or else I freeze them in bulk, double bagged in gallon size freezer bags. Isn’t it funny how life is pretty much the same every where, but you have to live it differently. You are bringing things to light I’ve never thought about when I visit my Mom. I know you are learning a lot of those difference by living there, some good, some bad, but I hope you are still happy with your choice to move to Denmark. That’s brilliant! You have always been resourceful, but now you’re taking it to new heights. There are some lovely things about Denmark and some not so lovely things, but I don’t at all regret siezing the opportunity to experience these things for myself. You can learn a lot by reading of others’ experiences, but it will never give you the perspective of experiencing them for yourself. Living here is much harder than I thought it would be, but the travel opportunities and the chance to jump out of my comfort zone, live a different way, and develop new skills makes up for it. If and when I move back to the US, I will never take a car, the shopping, the prices, the relatively low taxes, the general ease of life, and so many other things for granted. I think it’s easy to stay in the same place and see all that’s wrong with it and now having lived in two very different places, I can clearly see the pros and cons of each and I’m not sure that one’s better than the other, but of course, one will always be “home” and there’s a comfort that comes from that familarity. There are times that I curse myself for giving into the wanderlust, but mostly, I’m excited for what’s to come and I’m impressed with the strength and resourcefulness I’d never know I had if I’d stayed the safe course. So regardless of what I decide to do at the end of my contract, I will always look back at this season of my life as a defining one, I am forever changed.